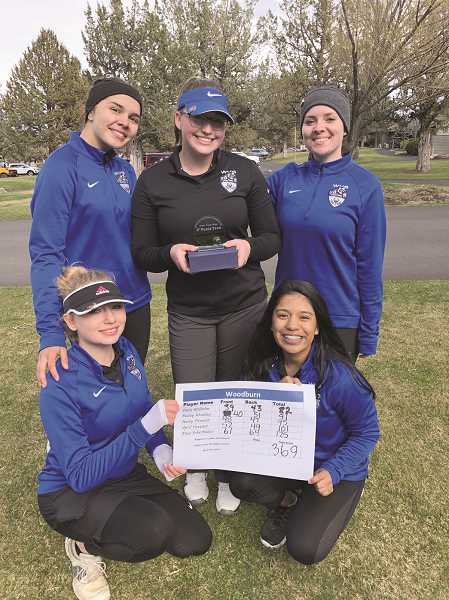 After battling through particularly difficult weather conditions throughout the month of March, the Woodburn girls golf team is ready to hit the links a little more consistently as the team prepares for the bulk of the coming season. "It's been the craziest start to spring sports, in terms of weather," head coach Neil Wilhelm said. "Snow and 32-degrees out. The course is frozen when we get out here at four in the afternoon. It's crazy, but the kids didn't miss practice." All the work on the course has thus far paid off for Woodburn after the team took home a pair of strong finishes last week. The Bulldogs opened their play on Monday, April 1 leading the field at the Blanchet Invitational at Salem's Creekside Golf Club in Salem with a score of 407. Woodburn placed three golfers in the top five, led by Wilhelm's daughter Paris Wilhelm, who placed second overall with a score of 86 behind Blanchet's Katie Goodwin (76). Returning veterans Bailey Woolley and Haley Elsasser placed fourth and fifth, respectively with scores of 103 and 105. Teammate April Vasquez tied for ninth-place with a score of 113, and varsity newcomer Nina Scherbakov rounded out the team with a 16th-place score of 125. Woodburn was one of three schools to field a full four-person team and was followed by Waldport at 436 and Newport at 542. Woodburn wrapped up the week at Eagle Crest Resort in Redmond on Friday, where the team placed second overall against a much-stronger field of competition. Every member of the varsity team either matched or improved their scores from earlier in the week, leading to a score of 369 that was second only to Valley Catholic's 348. Paris Wilhelm once again led the team, scoring an 82 overall to place fifth. Woolley shot a 91 to place 10th, while Elsasser was just behind at 95 to take 17th place. Vasquez nearly joined her teammates in breaking 100 by shooting 101 to take 24th. Scherbakov rounded out the team by matching her score from earlier in the week at 125. The Bulldogs opened the season with in March with an exhibition match at Fiddler's Green Golf Center in Eugene, going head-to-head against Sweet Home at the Par-3 golf course. Woodburn claimed the top four scores on the day, led by Wilhelm's 15-over 69. The Bulldog freshman shot par or bogey on all but two holes to lead the field, followed closely behind by Woolley (72), Elsasser (76) and Vasquez (84). While Woolley got off to a slow start, shooting triple and double bogeys on the first two holes en route to a front-nine score of 41, her recovered nicely on the back half of the course, shooting par or bogey on every hole for a score of 31, which was the best amongst the field. Sweet Home's top two golfers — Rebekah Fassler (91) and Brook Womack (92) — placed next, preceding Woodburn's Larissa Krivoshein (118) and Nina Scherbekov (120).